La comunicación mundo. Releer un mundo trasformado por las comunicaciones. Por Antonio Pasquali. Año 2011. Editorial Comunicación Social (Zamora, España). ISBN: 978-84-92860-21-0. The first book in the series is written by Antonio Pasquali, one of the most respected communication researchers in Latin America. His work is an invitation to rethink the human world from the perspective of communication. The author defines our era as the age of communication. The current abundance of communications based on the Internet, with its democratic nature, decreasing costs and its universality, have substantially reformed trade, education and politics. Antonio Pasquali studies the process of change from a communicative perspective such as the revolution imposed by the binary code against the linear, the city as the human space of social relationships, the education in the electronic age, and freedom of expression, etc. Comunicación Política en México. Retos y desafíos ante el proceso democratizador global. Por Norma Pareja Sánchez y Silvia Molina y Vedia (coordinadoras). Año 2011. Editorial Comunicación Social (Zamora, España). ISBN: 978-84-92860-17-3. The second volume of this book collection, sponsored by the Ibero-American Observatory of Communication, deals with Political Communication in Mexico. This work is coordinated by Professors Norma Sanchez and Silvia Molina Vedia. The book addresses issues related to the inertia of an authoritarian political system in coexistence with the new democratic values. It is structured around three themes (political communication and elections, political communication strategies, and political communication and the relationship between Mexico and the United States), with contributions from members of the research group of political communication at Mexican Association of Communication Researchers. Qué pasa con el estudio de los medios. Diálogo con las Ciencias Sociales en Iberoamérica Por Raúl Fuentes Navarro, Enrique E. Sánchez Ruiz y Raúl Trejo Delarbre. Año 2011. Editorial Comunicación Social (Zamora, España). ISBN: 978-84-96082-75-5. This books presents the debate about the identity of media studies as an academic discipline. Three authors of proven solvency are responsible for such dialogue: Raul Fuentes presents recent data from an update of the hypothesis of the Triple Marginalization of communication studies- or media- and its academic dimension; Raul Trejo enters into a fascinating tour that shows how literature has been considered the main object of study for communication scholars even before that the media academic field acquired its current institutional identity; and Enrique E. Sanchez, meanwhile, discusses the ideological paradigm shifts that have dominated the Social Sciences in Latin America, from the sixties to the present, emphasizing the need for interaction between media studies and Social Sciences under the multiple dimensions of such studies. Políticas de comunicações. Um estudo comparado: Brasil, Espanha, Estados Unidos, México e Venezuela Por Sayonara Leal, Murilo César Ramos y Elen Gerlades (orgs.). Año 2013. Editorial Comunicación Social (Zamora, España). ISBN: 978-84-15544-24-1. The conceptualization of communication public policy refers to the discussion of the relations between the state, the media and civil society. Historically, modern state institutions linked the definition of policies, among which are those of communication, with economic actors. Indeed, the implementation of these policies creates regulatory environments capable of solving the problems of imperfect markets, while correcting the abuses caused by economic agents through the complex relationships between regulation, democracy and capitalism. 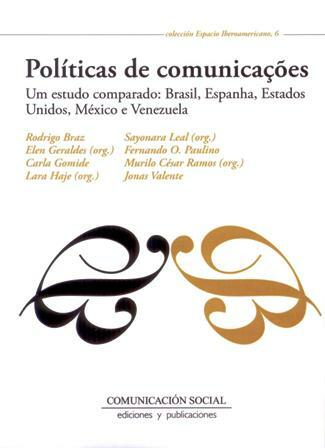 This work, developed by the Laboratory for Communication Policy (LaPCom) at the University of Brasilia, reveals the effort to build a regional and comparative empirical study, based on fundamental aspects such as: the relationship of the State with the media, the public participation in the planning of the communication, the mechanisms to encourage the presence of social actors in the public debate, and formulation of public policies focused on the development of new media. 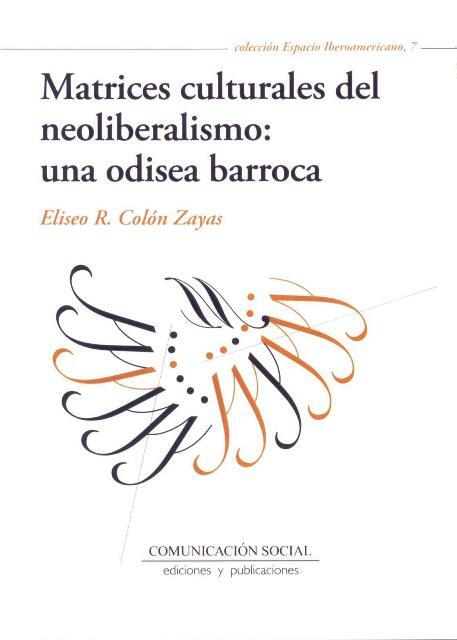 Matrices culturales del neoliberalismno: una odisea barroca Por Eliseo R. Colón Zayas. Año 2013. Editorial Comunicación Social (Zamora, España). ISBN: 978-84-15544-41-8. Contemporary research interprets the Baroque as a cultural phenomenon that arises in a specific historical situation and covers the breadth of cultural diversity through the chronological limits. While we can speak of different historical periods, each with a particular set of cultural phenomena and specific historical situation, it is possible to identify and describe a baroque culture fluid, which is not limited to a specific point in history, but that diachronically through to the present. In this sense, for example, the melodrama and the melodramatic, though they articulate sentimental proposal of modernity, work today as rhetorical mechanisms in the construction of a neoliberal populist culture based on a distinct market consumerism and a radical individual liberalism.